Whenever I went missing as a child, my mother would come looking for me in the pata, Lalitabai Meshram said, laughing out loud. My friends and I would play in the tangled vines for hours, making dolls of corn husk and hair, eating groundnuts, beans and waluk melon. Sometimes I would fall asleep there, recalled Meshram, now 50-plus. Last year, after about four decades, she carved out a pata from the familys four-acre (1.6 hectares) farm in Mendhla village in Maharashtras Yavatmal district. It is like an oasis in the middle of large cotton and soybean farms. Leafy vines of long beans (barbati) climbing up tall sorghum plants, interspersed with okra, pale pink bells of sesame flowers and pendulous waluk melons giving off a musky aroma. The pata now makes up the food basket for the Meshram family. 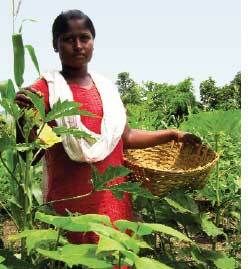 The small vegetable patch has restored the joy that was missing from agriculture, said Meshram. Agriculture in Maharashtras Vidarbha region had come to imply repeated crop failures, pest attacks, piling up loans and suicides. Meshram is one of the 4,000 women farmers who have come together to revive the practice of pata in Yavatmal, the heartland of Vidarbhas agriculture crisis. Traditionally, pata signifies a womans space in agriculture. Women would plant small strips of land with vegetables, fruits and spices, between the main crops like wheat, sorghum and pigeon pea. They would maintain and harvest them, depending on family needs. At midday or in the evening, before going home, my mother would visit the pata and pluck vegetables for the next meal or take something for a snack, Punjabai Bhagat, a 60-year-old from village Godhani, recalled. People working in the fields could always find something to munch on from the pata. Typically, she added, the pata supplied the family platter with fresh fruits and vegetables for about eight months in a year, and with pulses and oilseeds for the whole year; crops varied depending on the season. The pata ensured nutritional variety, Bhagat said. That was decades ago. The practice was lost following the Green Revolution and commercialization of agriculture, said Vijaya Tulsiwar whose non-profit Dilasa focuses on the revival of traditional agricultural knowledge and practice in Yavatmal. A survey by Dilasa in 2005 showed only 15 families in the district were practising pata cultivation. Three of the 260 households in my village and neighbouring Lalguda had pata, said Satibai Kumre of Mahadapur, a tribal village. They always did fairly well despite drought or soaring food prices. This inspired us to create our own pata. Women in Lalguda and Mahadapur villages were the first to revive the practice in the region. We had no seeds. Together, the three families had seven varieties of seeds, against the 16 to 18 varieties that women once sowed on their pata, said Kumre. Then there was another hurdleland shortage. Commercial mono-crop cultivation in recent decades has usurped the traditional space women had in agriculture. Most farmers in this region, with an average landholding of two acres, did not want to divert plots for pata and lose income in cash, Kumre added. Tulsiwar held meetings with women farmers in 31 villages in Jhari Jamni tehsil. The women pooled available seed stocks, which Tulsiwars non-profit bought and multiplied in 2006-2007 by planting them on the existing patas and on its five-acre nursery. To overcome land shortage, the women came to an arrangement with men of their families: three furrows on a two-acre farmland was decided to be the ideal size for a pata. Three furrows amounts to two-three per cent of a two-acre farm. The farmers now had no misgivings about losing income, said Tulsiwar. After much preparation, 750 women from these villages planted 11 varieties of crops on their patas in the kharif season last year. Meshram was one of them. Initially, the experiment did not instill much confidence among the women. The patas looked too small to sustain family needs even for a month, said Tulsiwar. But the result was spectacular. We did not spend on vegetables between July and November, said Sugandha Atram of Lalguda. We ate more vegetables during those four months than we had eaten in years, she said. Apart from okra, bitter gourd, snake gourd and beans, Atram harvested 15kg of moong, 11kg of urad and 6kg of moth (pulses). Kumre harvested a record 50kg of moong and 30kg of pigeon pea and 350 corn cobs. Revival of patas also helped the women revive traditional delicacies like til ka laddu, made of sesame seeds, and jowar lahya (puffed crispy sorghum seeds). With changing agricultural practices, cultivation of sesamea rich source of calciumhad declined and the indigenous sorghum variety, moti-tura, had virtually disappeared. Their consumption was restricted to festive rituals due to exorbitant costs. 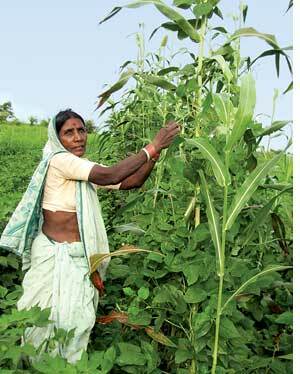 But last year, almost every family in the village harvested four-five kg of sesame and sorghum seeds, said Atram. We made laddus last the whole winter, she said. Women from Lalguda and Mahadapur estimate the patas helped them save Rs 3,000 to Rs 5,000 last year. More than that, they offered a variety of nutritious food. There is happiness only when there is plenty to eat, commented Atram. The best part was the main crop production was not affected by the land diversion for pata, said Maroti Marekar of village Godhani. What was lost in acreage was gained in pest reduction, he said. Maroti and his wife Ujjwala planted marigolds on their pata; the plant acts as a pest trap. It also yielded us fodder and compost. Following the initial success, Tulsiwar distributed 4,000 packets of mixed seeds in 180 villages in July for the kharif season; about 8,000 patas have been sown across the district. Scanty rainfall early in the season though did some damage to the legume crops, but the women harvested good quantities of vegetables; sorghum, corn and sesame crops also did well. Those who had created patas last year have expanded them this year. Satibai, for instance, planted three patas this year, with full support from her husband. He was apprehensive during the trial run. It feels good, he said: There is shade in the farm and enough vegetables to eat. My daughter and her friends go to the pata these days to play. It is a happy thing.